Is your professional network as diverse as the workforce and community around you? If not, you could be missing important opportunities for your career. We all face challenges in making meaningful connections, especially with people who differ from us in significant ways. Few of us consider the impacts of these missed connections. Even fewer know how to recognize and overcome them. 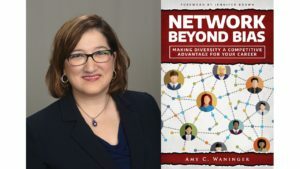 Network Beyond Bias: Making Diversity a Competitive Advantage for Your Career will help you assess and improve the breadth and depth of your professional network. You can remove the artificial barriers that may be keeping you from your next mentor, star hire, or big customer. To order Network Beyond Bias, follow this link. I hired Cathy after reading just 17 pages of On Your Mark. I had been thinking about writing a book for a long time, and I realized I needed some help to make that dream a reality. Cathy helped me with the hardest part: getting started. She showed me how to compile content I’d already created from my blog and presentations. With just two days of effort, I realized I was already halfway through my first draft. With Cathy’s guidance, I cut my writing timeline in half and published my first book several months ahead of schedule. What’s more, Cathy helped me celebrate every milestone along the way. I am grateful, from the bottom of my heart, for Cathy’s support, for the value she brings to this process, and for her genuine interest and personal investment in her clients’ success.